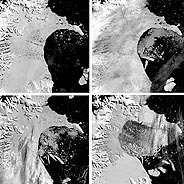 A satellite image shows the disintegration of an ice shelf about the size of Rhode Island on the eastern side of the Antarctic Peninsula. 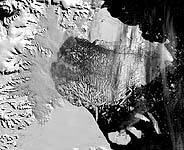 Satellite images over little more than a month show the disintegration of an ice shelf on the eastern side of the Antarctic Peninsula. A Rhode Island-size piece of the floating ice fringe along a fast-warming region of Antarctica has disintegrated with extraordinary rapidity, scientists said yesterday. The loss of floating ice does not contribute to rising sea levels, just as melting ice cubes floating in a glass do not cause it to overflow. But the researchers said this was the first time in thousands of years that this part of Antarctica  the east coast of its arm-shaped peninsula  had seen so much ice erode and temperatures rise so much. While it is too soon to say whether the changes there are related to a buildup of the "greenhouse" gas emissions that scientists believe are warming the planet, many experts said it was getting harder to find any other explanation. "With the disappearance of ice shelves that have existed for thousands of years, you rather rapidly run out of other explanations," said Dr. Theodore A. Scambos, a glaciologist at the National Snow and Ice Data Center at the University of Colorado, which has been monitoring the loss of ice in the Antarctic along with the British Antarctic Survey. Other parts of Antarctica have experienced different trends, including a cooling of the continent's interior in recent decades. The latest ice breakup occurred in the Larsen B ice shelf, which has probably existed since the last ice age. "There's no evidence of any period in the last 12,000 years where there was open water in the area that has now been exposed," Dr. Scambos said. For years, researchers hiking on the ice and using satellites have been watching pieces of the shelf slowly break away, but the disintegration over the last month was on a vastly greater scale, several experts said. "The speed of it is staggering," said Dr. David Vaughan, a glaciologist at the British Antarctic Survey. Starting in February, satellites recorded the event as the ice sheet fragmented into thousands of floes. Scientists say the likely culprit is rapidly warming summer air temperatures. Along that part of the peninsula, temperatures have risen 4.5 degrees in five decades, and hundreds of small ponds of meltwater have formed on the surface of the Larsen shelf and others nearby. The surface water migrates into tiny cracks in the ice, steadily deepening and widening them until the monumental structure starts to fall apart, Dr. Scambos said.